So we give briefly the leading events in the history of the Persian as of the Byzantine Empire. What is more interesting for us and less easy to give are the changes that went on in the lives of the general population of those great empires during that time. The present writer can find little of a definite character about the great pestilences that we know swept the world in the second and sixth centuries of this era. Certainly they depleted population, and probably they disorganized social order in these regions just as much as we know they did in the Roman and Chinese empires. The late Sir Mark Sykes, whose untimely death in Paris during the influenza epidemic of 1919 was an irreparable loss to Great Britain, wrote in The Caliph’s Last Heritage a vivid review of the general life of Nearer Asia during the period we are considering. In the opening centuries of the present era, he says: «The direction of military administration and imperial finance became entirely divorced in men’s minds from practical government; and notwithstanding the vilest tyranny of sots, drunkards, tyrants, lunatics, savages, and abandoned women, who from time to time held the reins of government, Mesopotamia, Babylonia, and Syria contained enormous populations, huge canals and dykes were kept in repair, and commerce and architecture flourished, in spite of a perpetual procession of hostile armies and a continual changing of the nationality of the governor. Each peasant’s interest was centred in his ruling town; each citizen’s interest was in the progress and prosperity of his city; and the advent of an enemy’s army may have sometimes been looked on even with satisfaction, if his victory was assured and the payment of his contracts a matter of certainty. «A raid from the north, on the other hand, must have been a matter for dread. Then the villagers had need to take refuge behind the walls of the cities, from whence they could descry the smoke which told of the wreck and damage caused by the nomads. So long, however, as the canals were not destroyed (and, indeed, they were built with such solidity and caution that their safety was assured), no irreparable damage could be effected… . «In Armenia and Pontus the condition of life was quite otherwise. These were mountain districts, containing fierce tribes headed by powerful native nobility under recognized ruling kings, while in the valleys and plains the peaceful cultivator provided the necessary economic resources. . . . Cilicia and Cappadocia were now thoroughly subject to Greek influence, and contained numerous wealthy and highly civilized towns, besides possessing a considerable merchant marine. Passing from Cilicia to the Hellespont, the whole Mediterranean coast was crowded with wealthy cities and Greek colonies, entirely cosmopolitan in thought and speech, with those municipal and local ambitions which seem natural to the Grecian character. 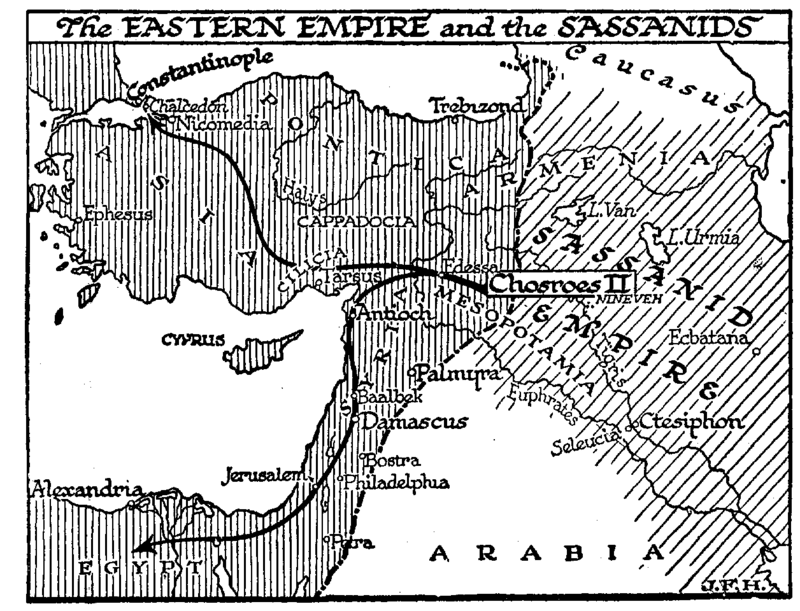 The Grecian Zone extended from Caria to the Bosphorus, and followed the coast as far as Sinope on the Black Sea, where it gradually faded away. «Syria was broken up into a curious quilt-like pattern of principalities and municipal kingdoms; Beginning with the almost barbarous states of Commagene and Edessa (Urfa) in the north. South of these stood Bambyce, with its huge temples and priestly governors. Towards the coast a dense population in villages and towns clustered around the independent cities of Antioch, Apamea, and Emesa (Homs); while out in the wilderness the great Semitic merchant city of Palmyra was gaining wealth and greatness as the neutral trading ground between Parithia and Rome. Between the Lebanon and Anti-Lebanon we find, at the height of its glory, Heliopolis (Baalbek), the battered fragments of which even now command our admiration… Bending in towards Galilee we find the wondrous cities of Gerasa and Philadelphia (Amman) connected by solid roads of masonry and furnished with gigantic aqua ducts… . Syria is still so rich in ruins and remains of the period that it is not difficult to picture to oneself the nature of its civilization. The arts of Greece, imported long before, had been developed into magnificence that bordered on vulgarity. The richness of ornamentation, the lavish expense, the flaunting wealth, all tell that the tastes of the voluptuous and artistic Semites were then as now. I have stood in the colonnades of Palmyra and I have dined in the Hotel Cecil, and, save that the latter is built of iron, daubed with sham wood, sham stucco, sham gold, sham velvet, and sham stone, the effect is identical. In Syria there were slaves in sufficient quantity to make real buildings, but the artistic spirit is as debased as anything made by machinery. Over against the cities the village folk must have dwelt pretty much as they do now, in houses of mud and dry stone wall; while out in the distant pastures the Bedouin tended their flocks in freedom under the rule of the Nabatean kings of their own race, or performed the office of guardians and agents of the great trading caravans. 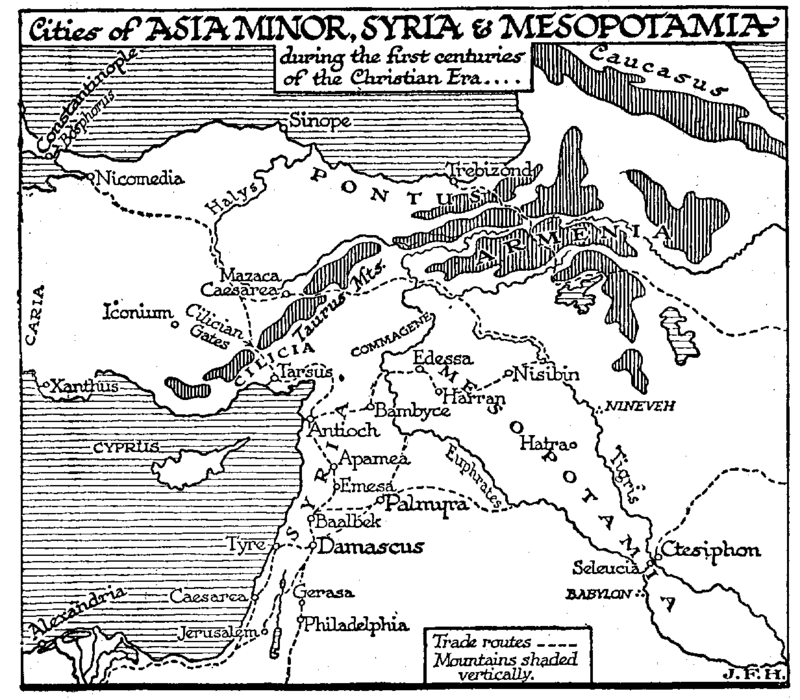 Cities of Asia Minor, Syria, and Mesopotamia during the first centuries of the Christian Era. «Beyond the herdsmen lay the parching deserts, which acted as the impenetrable barrier and defence of the Parthian Empire behind the Euphrates where stood the great cities of Ctesiphon, Seleucia, Hatra, Nisibin, Harran, and hundreds more whose very names are forgotten. These great townships subsisted on the enormous cereal wealth of Mesopotamia watered as it was then was by canals, whose makers names were even then already lost in the mists of antiquity. Babylon and Nineveh had passed away; the successors of Persia and Macedon had given place to Parthia; but the people and the cultivation were the same as when Cyrus the Conqueror had first subdued the land. The language of many of the towns was Greek, and the cultured citizens of Seleucia might criticize the philosophies and tragedies of Athens; but the millions of the agricultural population knew possibly no more of these things than does many an Essex peasant of today know of what passes in the metropolis». Compare with this the state of affairs at the end of the seventh century. «Syria was now impoverished and stricken land; and her great cities, though still populated, must have been encumbered with ruins which the public funds were not sufficient to remove. Damascus and Jerusalem themselves had not recovered from the effects of long and terrible sieges; Amman and Gerash had declined into wretched villages under the away and lordship of the Bedouin. The Hauran, perhaps, still showed signs of the prosperity for which it had been noted in the days of Trajan; but the wretched buildings and rude inscriptions of this date all point to a sad and depressing decline. Out in the desert, Palmyra stood empty and desolate save for a garrison in castle. On the coasts and in the Lebanon a shadow of the former business and wealth was still to be seen, but in the north, rain, desolation, and abandonment must have been the common state of the country, which had been raided with unfailing regularity for one hundred years and had been held by an enemy for fifteen. Agriculture must have declined and the population notably decreased through the plagues and distresses from which it had suffered. «Cappadocia had insensibly sunk into barbarism; and the great basilicas and cities; which the rude countrymen could neither repair nor restore, had been levelled with the ground. The Anatolian peninsula had been ploughed and harrowed by the Persian armies; the great cities had been plundered and sacked». Turanians from Turkestan or Avars from the Caucasus.